‘Wow, just wow!’ was my reaction on finishing this brilliant thriller. If you are regular blog reader, you will know that I am a big fan of the DI Tom Reynolds books by the same author and that they have appeared on my Top Reads list for the past two years. It’s only the second week of January and already I had two books on my top reads for 2018. The Confession is a more than worthy addition so, Joanne Spain, looks like you will have a hat trick! This book is billed as ‘the most addictive psychological thriller of 2018’. Addictive? I’d say so – I was reading it walking along the prom to my exercise class as I didn’t want to wait till I got home again! From the vivid and rather violent opening scene, I was totally enthralled by this story. Unusually for a crime novel, you know almost from the very beginning who has committed the crime but what this book is about is the ‘why?’. Julie and Harry McNamara are watching a thriller tv programme in their luxurious house in an affluent suburb of Dublin when JP Carney walks in and calmly sets about beating Harry violently with a golf club. Horrified, Julie can do nothing but watch. When he is finished, JP just as calmly walks into the local police station and confesses to the attack. He claims not to have known what he was doing or who Harry was, that it was a completely random attack. But Harry is a very well known banker who has recently been cleared of financial misconduct related to his investment bank’s activities at the height of the Celtic Tiger boom in Ireland. Investigating officer Alice Moodie is convinced that this was no random attack and is determined to prove it. Julie also believes it can’t be random but how is Carney linked to Harry? From that dramatic prologue, narrated by Julie, the story moves back in time as we hear variously from Julie, JP and Alice. Jo Spain adeptly relates the story of Julie and Harry’s relationship which is not as perfect as it may have appeared from the outside, despite or perhaps because of their wealth. In fact, this book is as much a dissection of their marriage as it is it a crime novel. As more and more about their relationship was gradually revealed, I couldn’t decide whether to be sympathetic towards Julie or annoyed at her for sticking with Harry for so long. However, with more details emerging, it became clear that the two were dependent on each other to keep each others’ secrets. As we read about JP’s childhood and more recent life, it becomes obvious that this was definitely not a random attack but exactly why is not apparent for a long time. And then we have Alice, still working away at trying to find a connection between Harry and Carney, despite the opinions of the medics and prosecutors. She also provides a little light relief throughout the book with her interactions with her fellow detectives. Through the viewpoints of these three characters, Jo Spain tells the story in a way that will have you reading just-one-more-chapter-oh-is-it-midnight-already? Well-drawn, believable characters all with their good points and their flaws will have you feeling sympathetic towards them at times while also feeling angry or despairing at their actions. Julie and Harry’s marriage in particular is fascinating to read about proving that old adage that nobody knows what goes on behind closed doors. Jo Spain takes you right into her characters’ heads and captures perfectly what makes them tick. 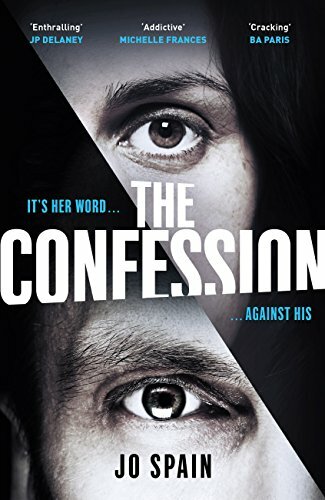 The Confession is such a brilliant written, expertly plotted book with lots of revelations carefully revealed at just the right moment to catch you unawares and keep you reading. It’s a book that’s crying out to be made into a tv series and it would keep you on the edge of your seat as you watched. But don’t wait – read it now and be on the edge of your seat as you read! It definitely could be, as mentioned above, ‘the most addictive psychological thriller of 2018’ so don’t miss out. My thanks to the publishers Quercus for my review copy via Netgalley. The Confession is published today in e-book format and will be available in paperback on 25th January. It will be available in good bookshops or you can order a copy online here. Great review Joanne! I loved it too. Time to dig this one out based on your review! Oh wow, I was on the face about getting this book until I read this review. It sounds amazing and glad to see that you enjoyed it so much. Fab review! Thank you – I hope you enjoy it as much as I did.